It’s been said that the most powerful story is one that can be distilled to a single, simple, easy to understand idea. The more complex the idea the harder it is for emotional content to be connected to (or absorbed from) it. It certainly makes sense from a marketing perspective if not necessarily an artistic one; easily understood is easily sold. From that point of view, Sing makes perfect sense. 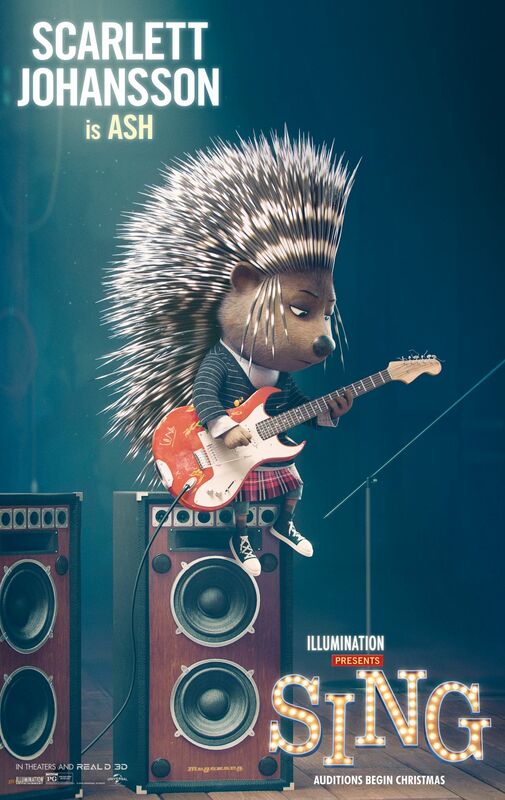 Animate some current pop songs with anthropomorphic animals to add in some fun animation antics and sit back. It’s a similar idea to the one behind stuff like Glee and Pitch Perfect but with more dancing pigs. It doesn’t really make sense in any other way, but that’s not particularly a deal breaker. The big driver is diminutive showman Buster Moon (McConaughey), the world’s best worst theater producer. In love with musical theater since he was a child, Moon has been trying to make a go with his own theater for years but has come up with nothing but disappointment. On his last leg and with the bank threatening foreclosure, Moon has one last brainstorm – a singing competition that will both discover new talent and get the city invested in seeing one of their own make it to the big time. When a type-o in his competition flyer brings singers out of the woodwork, Buster is beset with more talent than he knows what to do with, including overworked housewife Rosita (Witherspoon), gangster-in-training Johnny (Egerton), brash lounge singer Mike (MacFarlane), wannabe punk rocker Ash (Johansson), and shy shower singer Meena (Kelly). But it will all be for naught if he can’t get them to gel as an act or get anyone to come and watch, something he’s never particularly excelled at. Simple ideas can have entertainment value and for all its lack of an animating idea (no pun intended), and when Sing does what it sets out to do, it’s a solid time. It basically has two things to offer and not much else. The first is well-cast and directed voice work, primarily McConaughey. Buster is an irrepressible spirit, endlessly optimistic no matter what obstacles are thrust in his path. McConaughey imbues him with a can-do spirit and joy to be doing what he loves that his perseverance despite his failure is both funny and believable. He also eats up most of the screen time as his co-stars are constantly balanced against each other in order to keep their own stories understandable (if not developed) and reflect more light on Buster. And sing their songs really well, which they do. Egerton is a particular find and could easily have a career as a pop star if he decided to give up the whole acting thing. Beyond existing to have a place for the voice acting to emanate from the characters, Sing doesn’t have a lot to offer. They are necessary evils for source music delivery and so that producers Illumination (Despicable Me) can practice the imaginative gag construction they’ve become so good at. From Buddy’s desperate attempts to fix his ailing theater to a very personal car wash, Sing’s sight gags are where it’s real innovation can be found. 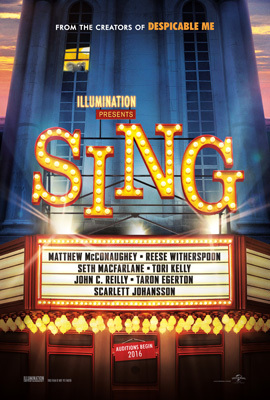 The second thing Sing has to offer, and the real success of the film, is the musical numbers themselves. The scenes take full advantage of the lack of physical constraints to fly cameras around and deliver impossible sets – a stage made up of water and glowing squids is the best – and sight gags well integrated into the songs themselves. There’s not a great deal more to it than that beyond some basic paean’s to self-belief as a necessary ingredient to a satisfying life, which should be very recognizable to anyone who has ever seen a modern animated film. There’s a longer essay to be had about the power of belief in modern studio storytelling and how it has changed with society. In the Golden Age of Film, it would have been religious belief which should be driving individuals. Studio storytelling hasn’t changed as much as we might think since then; religious believe has just been replaced by personal belief and Sing follows the modern studio playbook to the letter. All of that being said, what Sing does it does well and its lack of ambition isn’t a particular fault. Simple ideas make for simple pleasures, but there’s nothing wrong with simple pleasures; sometimes they’re the best kind. That’s basically the argument for the existence of pop songs to begin with, isn’t it?